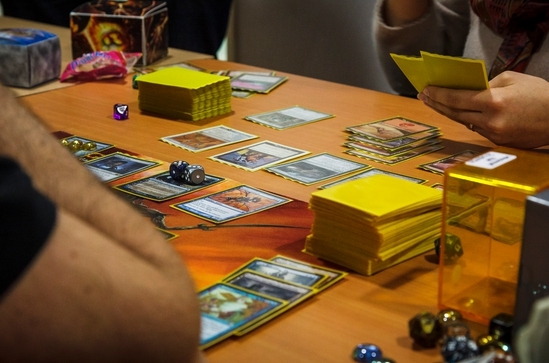 When it comes to card-based games, Magic: The Gathering is among the most recognized series in the community. Even Magic: The Gathering players though, may also experience the same enjoyment they get from playing Magic when they play another game. If you are part of this community, then chances are, there are games that may appeal to you as a Magic fan. If you are definitely in the mood to try something new, then here are several card games you can consider. Mage Wars Arena is developed by the minds of Arcade Wonders. Many players have compared this series to the likes of Magic: The Gathering and Dungeons & Dragons. Battles play out on a grid where players can choose and activate spells. There are 2-6 players in a game, and the Mage Wars Arena code set includes two spellbook binders for players to store their cards. The game is also supplemented by several expansion which offer more playability via multiplayer games. Mage Wars is a card game for players to assume the role of a wizards, which encompasses the duties of casting spells, using mana points, and putting their strategy and decision-making to the test. Players can also monitor resources such as abilities and summons that creatures can activate. The creature mechanics perform in a similar fashion as D&D. Creatures can make a quick move, change position, or charge up a special, powerful attack to use against the opponent. While playing Mage Wars, players can improve their miniature wargame skills via the deck construction process. Decks have a determined amount of spell points, with each card costing a unique set of points. As a game initiates, each player will start with 120 points in their spellbook. Players looking to test their skills in Mage Wars Arena can purchase the core set for 45 USD. This includes the beastmaster, priestess, warlock, wizard cards, and two spellbook binders. The franchise has added several expansions since its debut. These have added new classes such as forcemaster, necromancer, and paladin. This is not Plants vs. Zombies the video game, but the board game based on it. The inclusion of Plants vs. Zombies on this list is based on its sheer fun and playability. Similar to Hearthstone and other games, Plants Vs. Zombies Heroes has players assuming their hero character, who has exclusive, unique abilities. In Hearthstone, hero classes feature a unique set of cards with an exclusive pool of minions for the hero to access. With PvZ, heroes have two class groups, including the Green Shadow which combines the Smarty and Mega-Grow classes, Solar Flare combining the Kabloom and Solar classes, and Electric Boogaloo combining the Beastly and Crazy classes. Only 2 players are necessary to contest a game of PvZ. Similar to Magic: The Gathering, players can work with certain cards that are playable in specific events. The damage is not removed from fighter cards at the end of each turn. With this event, players can utilize a combination of strategies that integration both aggression and attrition. This makes the progress of each game interesting depending on how it plays out. Each hero will have one resource, for example, sunlight for plants and brains for zombies to use per turn in exchange for their card costs. The resources used in the previous turn are then replenished. Players can make land drops on each turn and do not have to be concerned about exhausting their mana. PvZ Heroes players will definitely be challenged, even if they have experience with the TCG scene. Attacking and blocking is managed by the lane that each fighter starts out in. If a plant and zombie consume the same lane during combat turns, they will end up attacking each other. Whereas, a fighter in an uncontested lane will attack an opposing hero instead. Overall, there are five total lanes, consisting of an Aquatic lane, Heights lane, and three Ground lanes. The damage is applied in a left-to-right order, beginning with the Heights lane until the Aquatic lane. Players can construct game plans that adjust according to the order in which damage is applied. The position and placement of a single fighter can hugely influence the outcome of a game. Players will experience four phases during a turn – both players can also have actions during a shared damage phase. During the Zombies play phase, Zombie fighters can be summoned. During a plants play phase, plant fighters, plan tricks, and plant environments can be summoned. Before a fight phase, Zombie heroes can activate their Zombie tricks and environments abilities. This allows Zombie heroes to counteract the advantage Plant Heroes enjoy by making decisions based on the summoning of fighters during the Zombies Play phase. Players can see the Super-Block Meter to determine whether to use their life totals and resources to win the game. Many Magic: The Gathering players also expend effort to master the skill of resource-management, which is primary component of the mechanics of PvZ Heroes. When a player takes damage, a random number of blocks between 1-3 will fill up the Super-Block Meter. With 8 blocks maxed out, the attack from the last block is negated, the hero then gets access to use its signature abilities. As this occurs, players will use up a shield slot. PvZ Heroes challenges players to think ahead and be strategic in the moves they make. One decision can have huge implications for how the game plays out. PvZ Heroes is Free-to-Play along with additional in-game purchases. With the absence of a secondary market, players can open booster packs and mold their cards to their preference to have a dynamic playing set. In regards to expansions, one update was the Galactic Gardens update. This was known as Set 2 and was released on June 8, 2017, giving players access to 100 new cards as well as new fighter abilities. Star Realms is developed from inspiration from the deck-building game genre. Star Realms utilizes a system that many Magic: The Gathering players will be familiar with. It has cards that allow players to maximize their damage pool, which is used for combating opposing players’ space stations and ships. Star Realms has a victor only when one player in the game is remaining. There will be many games in which the winner may also be one move away from being eliminated. Players can purchase cards from the trade row, which contain five cards that are delta from a randomized trade deck. Each card that leaves the trade row is immediately replaced with one from the trade deck. Players can select spaceship cards, which last for one turn are placed into a discard pile. Similar to Dominion and other deck building games, the discard pile is shuffled into a new deck after it is used up. The game throws a surprise at players by introducing the ability to remove certain cards from the deck. Players can no longer draw cards that are removed from the starting deck. Star Realms has 2 players with their own base set. The purchase of each base set or expansion provides the game to support additional players. There are four factions featured in the game, each with their own strategy and approach to winning the game. A player does not have to exclusively draw cards from a specific faction, but they do get rewards for maintaining a consistent deck through ally abilities. Each card provides an ability once it is played, a card will have an ally ability that only comes into play when a card of the same faction is present. Players must use resources to purchase cards. A multiplayer element of the game features players formulating a strategy on how to deal damage and approach various factions. Each player must learn to defeat each faction in the game. Players get rewarded for their ability to manage and select cards. This is a core drafting game. Great players are able to adapt based on the cards available. As a single game advances into its later stages, ally abilities become a more prominent theme. May players may commit to certain factions, but these can leave them vulnerable to more adaptable and flexible opponents. Strong decks in Star Realms utilize variations of decks from each of the factions. Star Realms can be played at its base purchase price of $14 to $15. This base set contains a trade deck with 80 cards and a volume of starting cards feasible for a two-player game. The game can also be accessed from a smart phone app or on steam. The app and steam versions of the game are valuable for demonstrating beginning players how to play the game. An expansion is coming up in the works, including Star Realms Frontiers, which raised over $1,000,000 through a successful Kickstarter campaign.